Mostly busts. It's more the system than it is the QB. So hard to separate the two. Sounds like the guy likes playing 6 degrees of Mike Leach. I can't say I have a whole lot of confidence in Kliff Kingsbury he had a losing record as a college HC and was literally fired last year. But now he'll somehow be good as a NFL HC. This is the most educational passing concept video I’ve seen in many years. Far from gimmicky, the design encourages the defenders to react, which they have to as the patterns show their intent. The ball Then goes to the one left helpless by his own choice. Josh can handle this as we’ve seen Foster cross up deep and separate. The coaching tree is noteworthy. I doff my cap to @The Senator for his devotion to Mike Leach from very early on. ....you dare quote the man's name!!!!! wheres the senator to give his point of view? To the OP, thanks for that video - hopefully it opened a few eyes. But, if Kingsbury couldn’t win with Mayfield and Mahomes at Texas Tech, I’m not optimisitic about his chances in Arizona. Thanks, my friend, for the recognition. I don’t doubt that Josh Allen could thrive in the Air Raid, but wonder if McDermott and Daboll could teach it and successfully implement it. Daboll possibly could. He spent about 10 years in New England, almost all on the offensive side. Belichick has been running elements of the Spread and the Air Raid forever, and used to meet with Mike Leach frequently. What they discussed, I have no idea, but I’m pretty sure it wasn’t deep sea fishing. I’ve been fighting that war since 2007, when Amendola and Harrell played for Leach and Holgerson at Texas Tech. Don’t know the reason why so many were so insistent that it’d never work in the NFL, particularly since NE and GB were already using it. Clearly, Protocal69’s video proves that Leach figured it out more than 20 years ago. Clearly, Protocal69’s video proves that Leach figured it out about 20 years ago. (3) I read his first book (Swing Your Sword), haven’t read his book about Geronimo yet, but may stream the final lecture of the course he’s teaching at Wazzu - ‘Insurgent Warfare and Football Strategies’. You’ll love the syllabus - how many TSW posters would love to design a play that he promises to use in this season’s opener? Some coaches seem to have a knack for sniffing out QB talent - Leach certainly being at the top of the list in the college ranks (come on, Gardner Minshew? ), but Dana Holgerson, Lincoln Riley and Kliff Kingsbury (all part of the Leach tree) are on the list as well. Leach has also said that most NFL scouts and GMs are maybe not so good at it - otherwise why so many 1st round flops? Why Jamarcus Russell a #1 overall pick, and Brady hung out til the 6th round? Tom Donahoe wasted a future first round pick on JP Losman. Because they want the best parts of his coaching without the douche-bag ego maniac part. Leach was primarily fired from TT for his repeated insubordination to his superiors. I read through the court documents back in 2010 and it's all there to see if you care to look. Can't let it go. The only schools that will deal with his personality are the fringe D1 schools who need more name recognition for the school's program. I think it’s quite pioneering. A concept like this guffaws at defensive strategies. ‘We’re hiring this HC because of his brilliant 4-3\3-4\Wide9 etc. philosophy’. This scheme lays ‘em all to waste. Oh, you’re playing Zone? I don’t Think so..
Edit: You’ll need 5 CBs on the field to have success against this. Who’s willing to do that? Edit2: Every stinkin’ Rule ever implemted in the League, from reshaping the ball for better passing efficiency to the brand new video replay for PI has been written to aid offense. This could be game changing in that regard as well. A losing team scores 50 points?? Last season may have been the 1st ever, but I bet it gets done again this year. Got it. Douchebag egomaniacs never get hired as NFL head coaches. Thanks for setting me straight on that one. For a brief nanosecond, I was thinking Rex Ryan was an NFL coach. Whatever transpired between Leach and TT officials in 2009 remains a mystery, because TT, as a public institution in the State of Texas, claimed ‘sovereign immunity’. What IS known is that TT used an incident between Leach and Adam James, marginal player and son of Craig James - former douchebag broadcaster, douchebag NE running back, douchebag ‘helicopter parent’ that wouldn’t stop calling Leach and other TT officials to demand more playing time for his talentless douchebag son - as an excuse to fire Leach. As recently as last Fall, many TT alums and some TT officials lobbied for Leach’s return, to which he reacted, “They didn’t pay me the last time”. Leach’s position is that TT screwed him out of approx. $2M. Leach is a lawyer, I’m not. What we do know as certainty is that he put the Texas Tech football program back on the national stage, had a winning record in all 10 seasons there, and was as worshipped and adored in Lubbock, TX as he now is in Pullman, WA. You’re comment about only “fringe D1 schools” wanting him puzzles me as well. Kentucky and Oklahoma are ‘fringe’ D1 programs? Washington State is ‘fringe’? He's also the guy who says dk looks like Megatron 2.0, although that's heracy here. Still trying to swim in the deep end, even though you pretty much drowned last time, eh? What transpired between Leach and TT officials is NO mystery unless you buy Leach's garbage. Depositions, TT emails and investigations were entered into the record and available online as part of the court process. Both James' were giant douchebags and their original assertion that Adam got put in an electrical closet was totally false via the trainer Pincock's deposition. What is clear (and Leach admitted) is that he did order James put into a darkened room and that he remain standing for practice and made to feel uncomfortable. Also, he ordered similar the second day, except that Adam was put in their media room. What was also clear (via emails and deposition testimony) is that Leach went off the rails to his superiors when they wanted him to write an apology, pay a fine and be done with the issue. This should have been a minor issue and Leach should have gotten a slap on the wrist but his ego wouldn't allow it. His contract absolutely had specific language that he had to look out for and do his best to ensure the well being of his players and known facts with Pincock's deposition clearly showed Leach's malice. The courts duly considered his arguments to waive sovereign immunity under these conditions and he lost. More than once. Even the Texas Supreme court was willing to consider Leach's arguments and ruled against him, keeping sovereign immunity in place. Leach also tried to have the immunity rescinded through the legislature but anyone looking into the actual facts could predict he would in fact fail. Even with sovereign immunity in place the Supreme court allowed Leach to try and get a non-monetary judgment against Texas Tech's decision and it never happened. Leach won't let it go or grow up and admit mistakes and it's miring his head coaching career. And, yes, I feel Texas Tech and Wash U were fringe programs Leach has helped put on the map. I don't dispute the man's ability to coach. He was only OC at Kentucky and couldn't find evidence of him ever being the head coach at Oklahoma, no neither of these is relevant. Well, we are all entitled to our own opinions. You have your opinion of Leach, I have mine. BTW, the reason Leach put Adam James in that darkened equipment shed is that James claimed he had a concussion, was unable to participate in team practice, and insisted that he could not take off his sunglasses due to sensitivity to sunlight - so Leach put him in a place where he could be on the sideline, out of direct sunlight, and made him ride a stationary bike. Kid was, just like his dad, a complete a**hole. He lied about the conditions, claiming he was confined in a darkened shed - the overhead door was open the entire time. He lied about being confined in a wiring closet, and emailed photos of the closet from his cell phone. He was in the same large, open media room where Leach held his press conferences. Then he and his douchebag dad conspired to get Leach fired. Leach was OC/QBs coach at both Kentucky and Oklahoma. His successes there got him the HC job at TT. Neither Texas Tech nor Washington State are ‘fringe’ programs. They are, respectively, Big 12 and PAC 12 teams. Yep, you have your opinions. 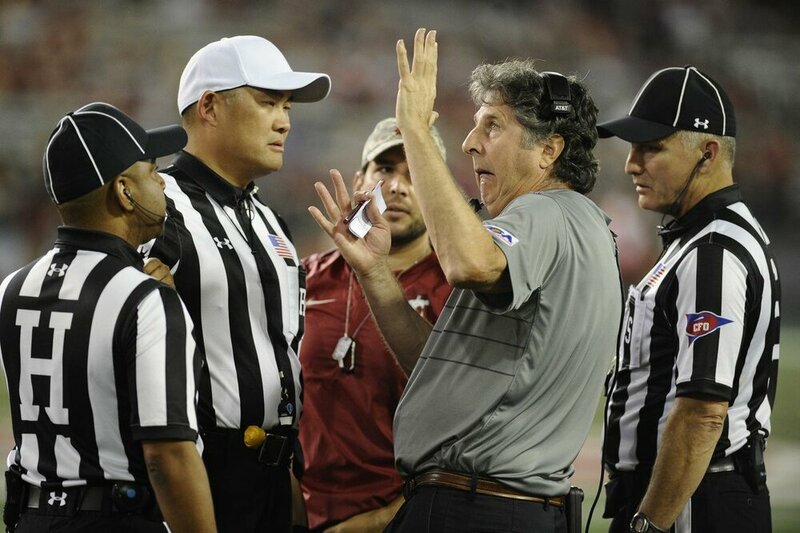 Too bad you completely ignore the actual evidence of Leach's insubordinate behavior. Well, the courts didn't, Leach lost because he violated the terms of his contract, not TT. You can listen to l(aw)yer Leach all you want, you share an abundance of hot air with him. The two James' did conspire to get Leach fired but there was no need. Leach's big mouth took care of everything. And while the shed had a garage door it was closed when Adam was put in there. He was not locked in as the James' asserted. Pincock assigned an assistant trainer to stay at the outside door and check on Adam regularly.